A forearm tear can be a serious barrier to your fitness. 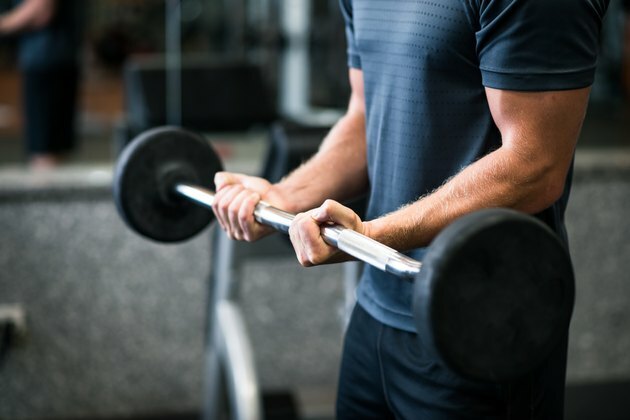 If you like to incorporate arm training in your regimen, pay attention to important signs that indicate a forearm injury. The sooner you notice the symptoms, the faster you can get help and get back to your weight training. Your forearms are made of many muscles, including the brachiordialis, which helps you move your forearm up and down -- and the wrist flexor, which helps you turn your wrist. Strain is most common in sports that constantly require engaging the forearms, such as tennis or baseball. Some risk factors for forearm strain are repetitive actions that stress these muscles, prior injury and muscle fatigue. According to Winchester Hospital's report on forearm muscle strain, there are multiple symptoms of a forearm muscle tear. You may not be able to fully flex or stretch your wrist and fingers and may feel pain when you try. Your forearm can also feel tender or sore or become swollen. Muscle spasms, in which your forearm tightens without you flexing, is another potentially painful forearm muscle tear symptom. These injuries can happen due to overworking your forearms and are a sign that you need to stop, rest and seek help.